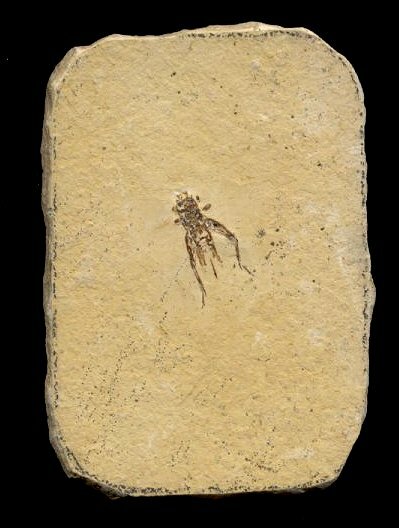 This is a very nice fossil insect. It is a fine Cricket from the Cretaceous of Brazil. The insect is very well defined and exhibits excellent detail - the head, body, and legs of the cricket are very easily seen, even the barbs on the legs are present. The dark-brown color of the insect contrasts beautifully with the light-colored matrix. The distinct fossil is well showcased on the somewhat rectangular plate of matrix. 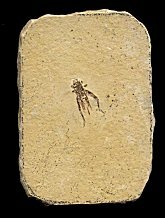 This is a great example of a fossil Cricket from the Time of the Dinosaurs!